Bad parenting bothers me quite a bit. So, you can imagine my disgust at the idea that four parents all manage to behave terribly enough to ruin the Christmas for three kids. It appears to take them quite a while to put together the events of the previous night, and, considering everyone is 30+ (as that's Kate's age), that's downright ridiculous! Diane having a secret relationship, while immature, made sense to me, though. I could understand not wanting to be seen failing at multiple relationships. A birthday curse is an idea that has been played up on television before, but Peter perhaps had some of the worst luck (not getting to drive the rented Ferrari??). I think the best moment in the past few episodes was Kate realizing that she was "okay" with not going out all the time anymore... that's a huge thing for a lot of people our age (I say this even though I feel much younger than she seems!). 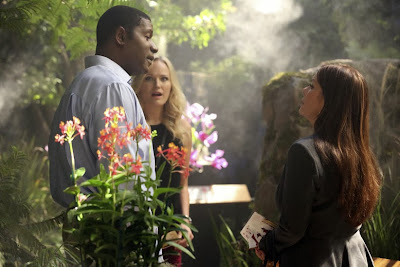 Trophy Wife "Russ Bradley Morrison" (S01E09): Pete is sick, so Kate has to chaperone Warren's field trip with Diane. Kate isn't happy that Diane is mean to her, and Warren suggests that his mother "get some," without knowing what that means. [ha!] Kate agrees, and spends the morning trying to find a good match for the uptight doctor. [LoL at Warren helping find potential suitors for his mother!] Kate finds a good match... so good, in fact, that he and Diane have been secretly seeing one another for two years, and she is choosing to stay mum to make sure nobody knows of another potential failed relationship. [ouch. that's the sort of thing I hate, but can understand.] Diane winds up admitting in front of the students that she enjoys "talking" to Russ Bradley, which is a big step for her. Meanwhile, the rest of the characters have their own adventures all day... Jackie goes to Diane's office to ask for money for the gift from the kids (enormous windchimes), but Diane doesn't accept the gift, so they leave to return it. [Diane is my favorite character sometimes, you guys!] Diane has to be pushy for a refund, but the day only gets worse when they arrive at a spa to buy Pete a certificate for a massage. They get talked into a couple's massage, then get kicked out when they cause a scene, forcing them back to the original shoppe to re-purchase the chimes.